Its only taken a good two years but the first Cameo and Full appearance of Crossbones, Captain America #359 and Captain America #360, are finally selling above $10. This week a picture of Frank Grillo on set in costume as Crossbones hit the internet, and like Raccoons on garbage day, reasonably priced copies of the first appearance of Crossbones have been ravaged off ebay bringing the price up. Last sales for Captain America #359 and Captain America #360 have reached upwards of $50 in near mint condition, which is a huge jump from last week! Pictures of one of the first scenes to be filmed for Captain America Civil War leaked online two days before the Crossbones news – it shows them filming a funeral scene. Could this mean Captain America dies? This week they are planning on filming a fight between Flacon and Crossbones. Another possibly sign that Captain America dies in the Civil War Film. So what does that mean for speculation? Now is the time to buy up Captain America #25 – the death and funeral of Captain America. 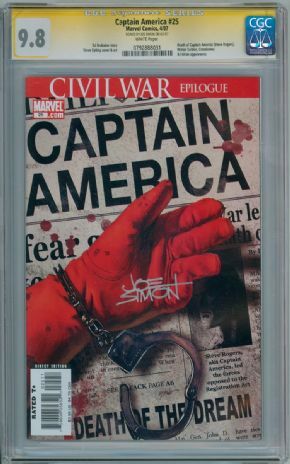 If you’re going to buy CGC copies you will want to seek out Joe Simon SS – as those will hold a huge premium over all other copies. 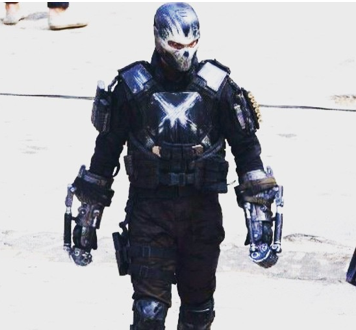 Looks like Crossbones has Viper’s dart shooters on his arms. I remember somewhere they listed 3 camios for Crossbones, 360 was one of them.